Earlier this summer, Keith and I finally had a chance to visit Campo di Bella in Mt. Horeb for one of their farm to table dinners. It is a winery and family farm owned and operated by Marc and Mary Ann Bellazzini. Discover Wisconsin (the nation’s longest running tourism show) happened to be filming the evening we attended. We started with some wine, enjoyed the view on the patio, and found our seats at one of the two long tables that were set up for the evening. The waitstaff (including a couple of Bellazzini kids) served five courses to the guest which started with stuffed zucchini flowers and ratatouille on crostini. The main course was really special to Mary Ann because she had recently inherited the recipe for the sausages from her grandparents. The sausages (best thing we had that night) were plated with roast chicken, red wine and balsamic vinegar braised cipollini, and steamed Romanesco broccoli. By the way, the chickens were raised just down the road by a woman named Bird. I am not making this up! 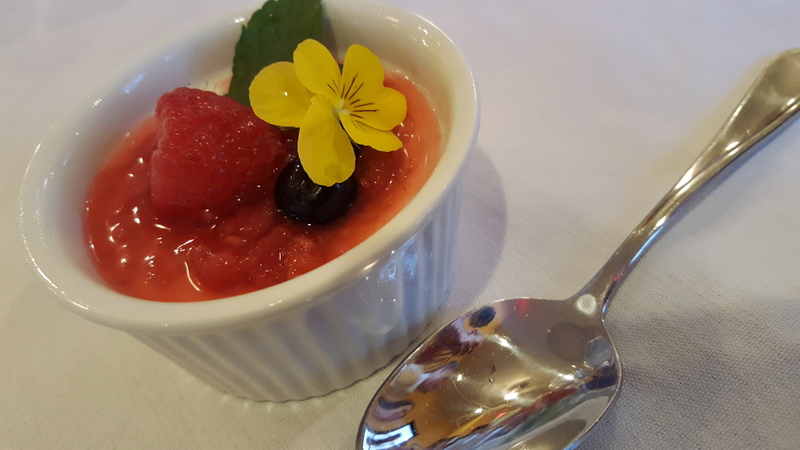 After munching on some local cheeses and berry panna cotta for dessert, I got to chat a bit with one of the Discover Wisconsin hosts, Mariah Haberman. The first thing I asked her was how she managed her weight having to eat the many multi-course meals that comes with the job. “Share with the crew!” was her answer. She also happened to mention how much she loved the Driftless region and how eager she was to know more about the people in the area. And I must mention the woman who sat next to me during dinner, Roberta Barham, aronia berry expert. The night ended with a speech by Mary Ann and applause all around for the chef (her husband Marc) and the staff. If you live or happen to be in the area, be sure to check out their wine bar, cooking classes, and special dinners. 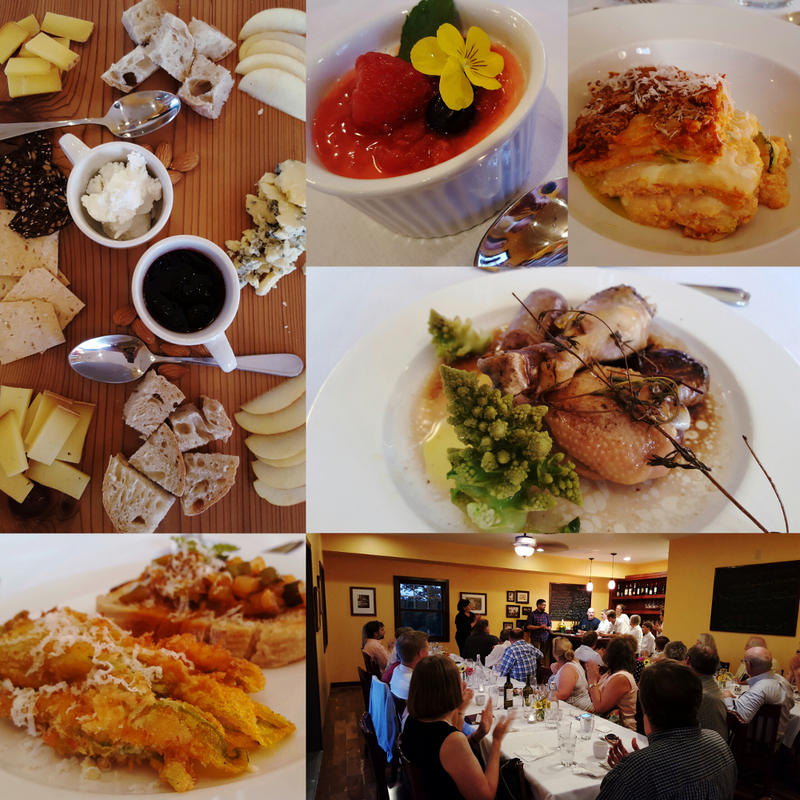 Coming up this weekend is a dinner featuring Sitka Salmon and a cheesemaker’s dinner featuring Uplands Cheese. We enjoyed our time there we look forward to visiting again. Anyone who cares to know about the land they live on and who want to share its beauty and fruits with others is pretty wonderful in my book. In case you didn’t know, Campo di Bella means “beautiful field”, made extra special with babydoll sheep frolicking in the fields!